Координаты рарников Нагорья в режиме Warfront дропающих маунтов/петов/игрушки. Т.к. позиция нескольких раров отличается для двух фаз контроля зоны(Орда/Альянс) то и макросов, соотв., тоже два. Видео "WOW:BFA Месторасположение и ЛУТ всех РАРНИКОВ (+WB) на Фронте в Нагорье Арати!" Все ссылки, координаты и макросы в описании под видео! Рарник встречается лишь когда Альянс удерживает фронт. Doomrider Helgrim can be find at coordinates 53.8, 58.2. Всадник рока Хелгрим rare is located in BfA Arathi Highlands zone Go'Shek Farm subzone. Alliance only and Horde version is Рыцарь-капитан Алдрин with Объезженный нагорный мустанг drop. Has a chance to drop: Нагорный мустанг Mount. Here is the tom-tom coordinates for all of the Arathi Rares that drop toys, mounts, and pets. The only Elite I didn't include in these macro's is Fozling because he patrols all over Arathi Highlands. I also left out the World boss and the 4 Goliaths. This list is strictly Mounts, Pets, and Toys. Happy Hunting and goodluck! Use the waypoints below in Нагорье Арати. He seems to be bugged at the moment. Nobody has seen him spawn for a couple days now. He takes an E T E R N I T Y to respawn. I had to switch war mode ON. I was told it was bugged. After an hour of waiting I was told by a guild member to switch War Mode to ON and go back, sure enough there it was when i switched. Hope this helps. There are 6 Arathi Basin warfront mounts. A note on Krix: If you are Allaince and control the zone, you will be going to the northern mine whereas Horde with Horde controlled will find him in the southern mines. I'm sure he used to be rare, but he's now just a normal elite. Has anyone seen Helgrim since 8.1 dropped? I spent the better part of a half-hour keeping the barn and surrounding area mowed down (as backflipkgo suggests below), but he's yet to spawn for me. 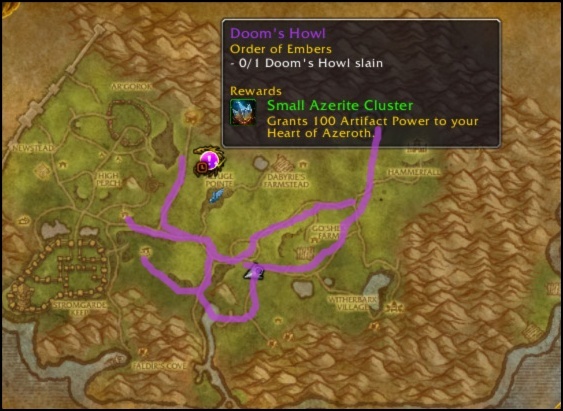 Seems to be bugged on at least Argent Dawn EU as of 01/01/2019. Maybe it's bugged on some other RP servers as well? Realm hopping solved it for me and 2 buddies at least. He respawned again after being killed within 2 mins so if he doesn't appear after 2 mins I suggest switching realms. The WM off bug was supposedly fixed, but as luck would have it, I had WM off because I was on bad/slow motel internet while traveling; I usually have it on. It seems he will no longer spawn with WM off. I had to reluctantly turn WM on despite my bad internet problem, to get him to spawn. Thankfully the Horde were not around while I was suffering slow and laggy motel internet. To reiterate, make sure WM is ON, at least as of the date and time of this post. Maybe it will be fixed soon. Update: Had to go WM ON to kill him again later when the quest respawned about 6 hours later. Update 2: Total of 5 kills (three kills since my original post) had to go WM on for him to spawn. Back home now on my own internet and experimented with WM on and off. He will not spawn, for me at least, with WM off. Second day in a row that he was up for world quest. No joy on finding him spawning. Until I checked here. After waiting for a while and killing mobs in the area (that might make him spawn), I switched to war mode. Came back, there he was waiting for me (Aerie Peak - US). As of my experience so far, war mode off is bugged, and war mode on was good with this NPC. Этот NPC может быть найден в следующих зонах: Нагорье Арати (5).